Dental issues are no trifling matter, since they can be severe and may need immediate attention. Emergency Dentists exist for the sole reason of dealing with these issues at times when going to a normal dentistry is not possible. A city with a population of more than 150,000 people, will not be complete without a few emergency dentists, which is why, Alexandria in Virginia has some very qualified emergency dentists. This city also has one of the oldest and richest histories in Washington, D.C. The city is quite heavily populated in comparison to its size, which is why there should be emergency dentists in this part of Virginia to look after the dental needs of such a population. Normal dental clinics are closed on Saturdays and Sundays and in some cases, on another day of the week as well. What is an emergency dental patient supposed to do in a situation where they require immediate help during the weekends? For those that cannot wait for the dentistry to resume working on Mondays, emergency dentists are open during the weekends and after hours on the weekdays to serve those in need. One might not see the need of an emergency dentist until an emergency strikes and the need arises. There are several different dental issues out there that require immediate attention at times, as a failure to do so could be fatal. This is why one must always note the numbers of a few emergency dentists, you never know when you might need it. If things go bad and you don’t know who to call, you can also contact 911 at any time. That said, it is still handy to have a few emergency dentist numbers nearby. 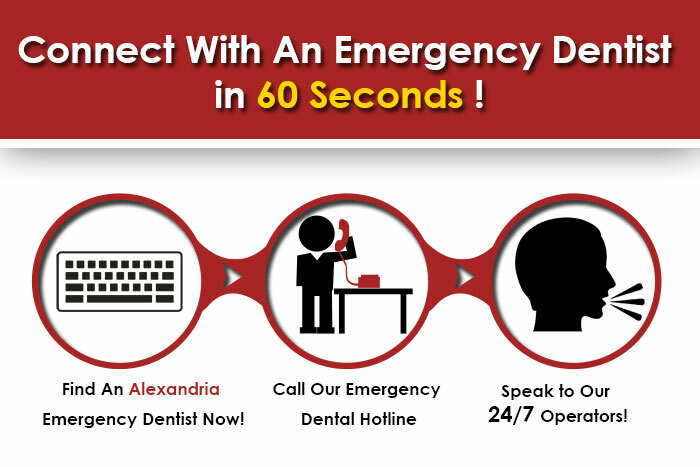 Here, we have compiled a list of emergency dentists located in Alexandria, Virginia. DescriptionThis city has been known to be home to many of defense workers, and has a great economy! If you are spending time here and encounter sudden dental pain, don’t think you are alone! Pick up the phone and dial our easy to use hotline, and you’ll be on the way to someone who will provide you relief within minutes. A comfortable dental service is guaranteed in the Green Dental of Alexandria and they are also very accommodating and look well after your needs. They accept same day appointments as well. You can either email them to schedule an appointment or call them at 703-549-1725. They provide several different dental procedures with the use of advanced technology, such as laser dentistry, Invisalign, and digital x-ray. They also provide the option of evening and Saturday appointments for emergencies and for those who cannot make time for a dentist appointment on weekdays. Call them at 703-955-3960 to book an appointment with them. Want to get an appointment at a 24 hour emergency dentist in Newport News, VA?